Last night I made a quick stop by Yerena Farms and I grabbed a hearty helping of Squash Blossoms. 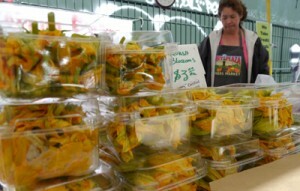 Squash Blossoms are large, yellow, edible flowers responsible for producing squash. However, this particular group of blossoms had a different destiny. Many MCM patrons might not know how to cook these tasty little morsels, so here’s the simple recipe I used for making delicious stuffed squash blossoms. Follow these instructions and you’ll be cooking like a gourmet chef in no time! The first step is to remove the stamen from the blossoms. The blossom itself is very fragile so you want to do this without tearing them. Do not wash the blossoms, because doing so will make this process harder! The Stamen is the male reproductive part of the flower and though edible, it is a large protrusion that will make stuffing the blossom harder. 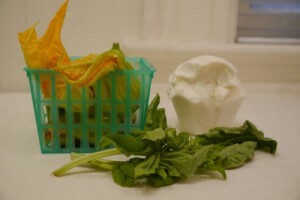 Once you have removed the stamens, you are ready to make the stuffing. Mix the cheeses, basil, salt, pepper, and garlic together. Put the mixture into a ziplock bag and cut one of the corners. Ta-da! You just made a makeshift piping bag! If you already have a piping bag, extra points to you, you may sip on your beer while the rest of us catch up. Now you can begin to stuff the flowers. If you choose to stuff the blossoms with a spoon, one tablespoon per blossom will be more than enough. After you stuff the blossom, twist the tops to prevent any of the stuffing from oozing out. Don’t worry if you tear the blossoms a little bit in the process. Now you start heating some oil in a pan for frying on low. Make a batter with the flour, egg and a little beer–it should be about as thick as pancake batter. Dip the stuffed blossoms into the batter and make sure they are covered evenly. 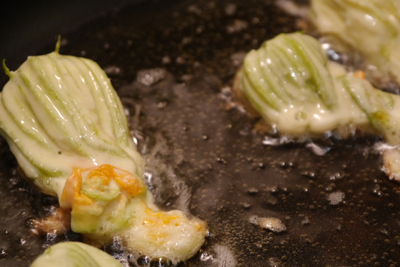 Test your oil to make sure it’s hot enough for frying and begin to drop the blossoms one by one into the pan. Flip them only once, and take them out when they have a nice golden color. Place them on a paper towel to absorb any extra oil and after a minute or two left for cooling, your stuffed blossoms are ready to eat. 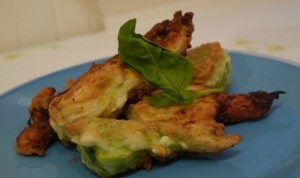 The stuffed blossoms have a mild flavor, so they are best when accompanied with your favorite marinara sauce. Mmm! These little treats are delicious and surprisingly crispy!